The perfect gift for someone special. Personalize it with a 7/8" disc stamped around the edge of the disc in our block, lowercase, or script font. Stamp your family’s names, pet’s names, or affirmations. 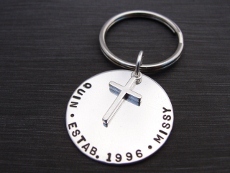 The Key Chain comes in a brushed silver or polished finish. 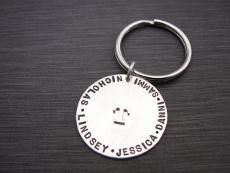 You can add a raised initial charm that is soldered to the top of the disc. Block font can accommodate 28 characters, lowercase 25 characters and script 22 characters.